The open house for prospective band members will run from 6-9 p.m. at the high school. An information meeting for parents will begin at 7:45 p.m. All continuing members of the Blue Devil marching band will also be in attendance. Work on the new season’s competitive show will commence that evening. The Blue Devil marching band has already announced its summer schedule of activities. A calendar is posted on the Huntington UFSD’s website at www.hufsd.edu. The band will host a training camp for members on August 12-15 from 1-4 p.m. and 5-8 p.m. The group’s annual summer band camp is slated for August 19-25. The camp will culminate with a family show on Sunday August 25 at 2 p.m. The Blue Devil marching band’s 2019 show is titled “Disruption.” Students are already learning the music for the show. 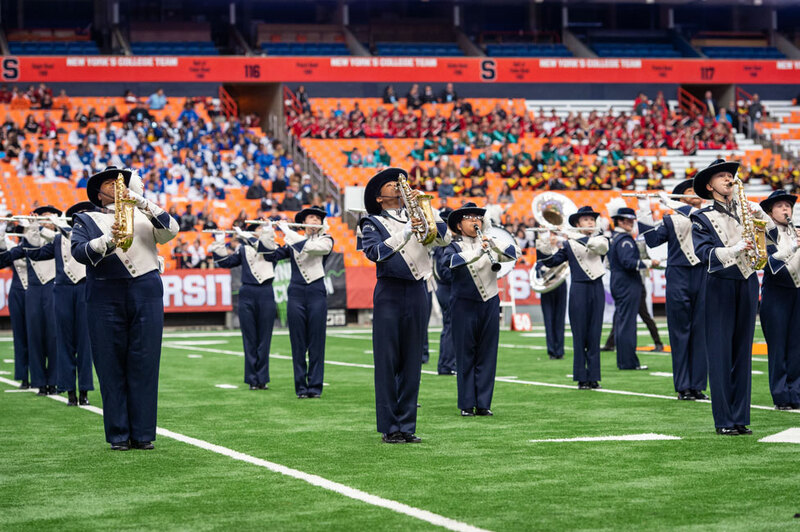 Huntington will compete again on the New York State Field Band Conference circuit, which culminates with the state championships at the Carrier Dome in Syracuse in late October. Jennifer Low, Michael Reed and Robert Jean-Gilles will serve as the Blue Devils’ drum majors. Andrew Knowles is set to be the field major. It’s a group of incredibly talented teenagers. The band’s student leadership also includes flute section leaders Molly Kessler and Natalie Ciccone; clarinet section leaders Neil Jean-Baptiste and Catherine McCooey; alto sax section leader Carrie Kilgour; low brass section leaders Zubair Ali and Michael Mathews; mello section leader Aileen Lopez; trumpet section leaders Nathan Musso and Jose Suarez and tenor sax/baritone sax leader Miles Tierney. Nathan Musso will serve as the brass captain with Neil Jean-Baptiste as the woodwind captain. Oskar Kilgour has been named the battery captain. Peyton Kalb and Natalie Furman will lead the pit section. Kyra DeSalvo and Jasmine Clark will be the color guard captains. Now in its 85th year, the Blue Devil band was founded in 1934 by music teacher James Cloyd Doty, a graduate of Oberlin College in Ohio who came to Huntington High School in 1924 and remained a fixture for decades. Principal Robert L. Simpson helped spur the development of the band. Mr. Simpson was a lover of music, pure and simple. He wrote school songs, sang them and played musical instruments. Few things were closer to his heart than the music program at the school and in the community. The General Organization, as the student government was then called, helped raise the funds necessary for the first band uniforms in 1934.